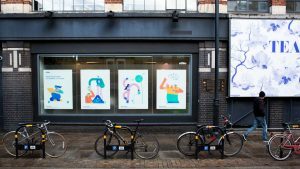 ustwo, the Shoreditch-based digital product studio behind groundbreaking ideas for Ford, Three and Fresenius Medical Care, is transforming the look of its own building with a stunning new window display. From 2nd April the windows of ustwo’s building on Shoreditch High Street will be filled with new illustrations, created by the agency’s designer Simon Child. ustwo set out to create illustrations that avoid the typical abstract shapes used by companies, and instead convey the human side of transformation in an optimistic way. The studio approached the project by bringing the principles of strong shapes and bold colour to Shoreditch High Street, as it has previously achieved in its designs for Monument Valley, the video game it developed, and Alder Hey, the children’s hospital.